Is Trump on Path to ‘Strategic Patience’ on North Korea? FILE - U.S. President Donald Trump shakes hands with North Korea leader Kim Jong Un at the Capella resort on Sentosa Island, June 12, 2018, in Singapore. President Donald Trump could find himself embracing “strategic patience” on North Korea, an Obama administration approach he once denounced, as nuclear talks with Pyongyang have stalled, analysts say. A Trump tweet Friday showed the president’s evolving position. And this policy pivot follows growing concern in Washington that denuclearization of North Korea is likely to be more complicated and take longer than the Trump White House expected. Washington’s talks with Pyongyang have been stalled, and North Korea has not taken concrete steps toward denuclearization. North Korea abruptly canceled a scheduled meeting with U.S. Secretary of State Mike Pompeo in early November, and U.S. Special Representative for North Korea Stephen Biegun, appointed in August, has yet to meet with his North Korean counterpart. 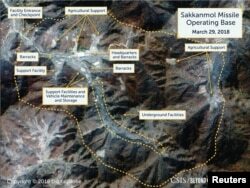 A Digital Globe satellite image taken March 29, 2018, shows what CSIS' Beyond Parallel project reports is an undeclared missile operating base at Sakkanmol, North Korea, and provided to Reuters, Nov. 12, 2018. Satellite images of North Korea throughout the year showed that the country has not stopped its nuclear and missile programs. The most recent image obtained by CNN last week indicated North Korea might be expanding its key long-range missile base with a newly constructed facility. Former U.S. officials and analysts are concerned North Korea’s unwillingness to denuclearize despite the historic summit between the U.S. and North Korea will lead the Trump administration to adopt “strategic patience” as a default policy choice. Trump said “the era of strategic patience is over” last year when dealing with North Korea and took on the policy of “maximum pressure”​ while engaged in diplomatic talks with Pyongyang this year. 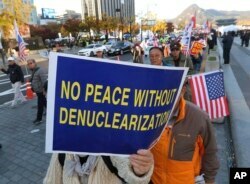 Protesters march toward the U.S. Embassy during a rally supporting the United States' policy to put steady pressure on North Korea in Seoul, South Korea, Nov. 3, 2018. Gary Samore, the White House coordinator for arms control and weapons of mass destruction during the Obama administration, said strategic patience is a result of a policy rather a policy itself. According to Samore, the Trump administration is following the same policies of “economic pressure and promises to induce North Korea to accept denuclearization” as the Obama administration had done, with the exception of meeting Kim. “The biggest difference between Trump and Obama is President Trump’s decision to meet directly with Kim Jong Un to start the negotiation process, the so-called ‘top-down’ approach,” Samore said. Gause said the U.S. will drift toward “strategic patience” as long as North Korea’s demand for economic concessions remains unmet. 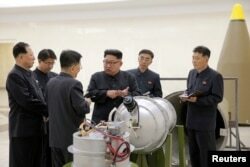 FILE - North Korean leader Kim Jong Un provides guidance on a nuclear weapons program in this undated photo released by North Korea's Korean Central News Agency in Pyongyang, Sept. 3, 2017. “Despite clear evidence that [North Korea] is expanding its nuclear and missile capabilities, President Trump has removed the timeline for the North’s denuclearization,” he said. However, Scott Snyder, director of the Program on U.S. Korean Policy at the Council of Foreign Policy, said Trump’s approach toward North Korea differs from the approach that the Obama administration took. “The Trump administration’s approach involves conscious application of increasing pressure toward North Korea designed to drive toward a decisive point, rather than waiting more passively for North Korea to make a decision,” Snyder said. Trump has said he is willing to meet Kim for a second summit as early as January or February of next year. Pyongyang, however, has not accepted the summit offer, at least publicly. On Thursday, North Korea blamed Washington for stalled denuclearization talks, while saying it remains open to discussion and progress. North Korea’s state-run Korean Central News Agency (KCNA) said, “How can a negotiation train move when North Korea is the only one moving and the U.S. is standing still.” It continued, “We are waiting with patience” for the U.S. to take corresponding measures.